Lucy Jones, 24, is described as one of the world’s brightest entrepreneurs by Forbes Magazine. 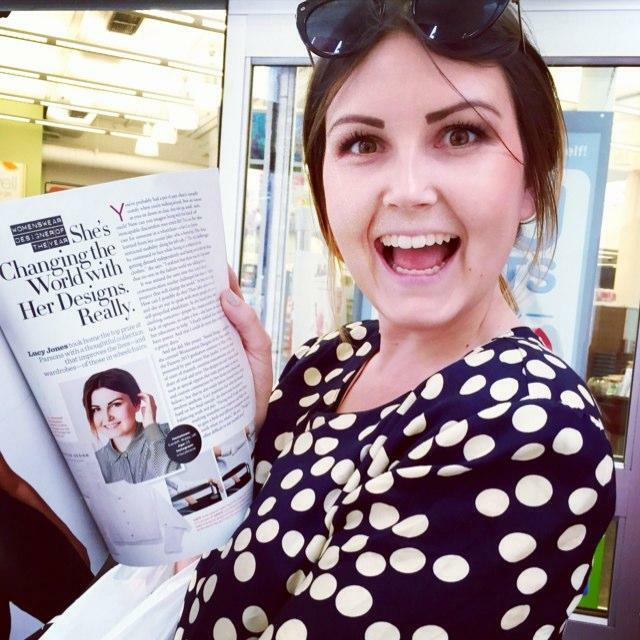 Forbes named her to its 2016 30 Under 30 list for her work designing clothes for people who use wheelchairs: "Her modular pieces incorporate features like added fabric on kneecaps and elbows, zippers that run the length of the arm, and snaps and magnets that make dressing easier," Forbes says. 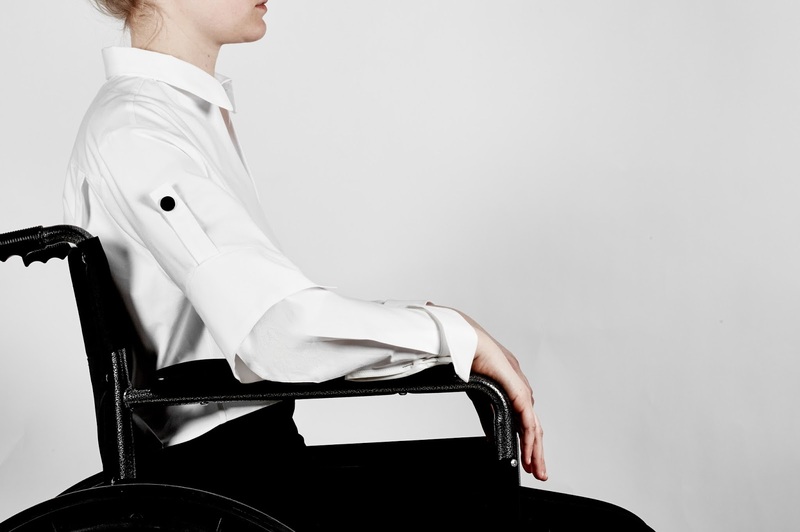 Lucy, originally from Wales, now works in New York City for designer Eileen Fisher and Runway of Dreams, a not-for-profit that's pushing mainstream labels to produce adapted versions of clothes for kids with disabilities. You may remember our story on designer Mindy Scheier, the mom who founded Runway of Dreams when her son Oliver couldn’t pull jeans over his leg braces. BLOOM spoke to Lucy about her clothing collection Seated Design, which she developed as a graduate student at the Parsons School of Design in New York. BLOOM: I read an interview where you talked about how clothes express identity. 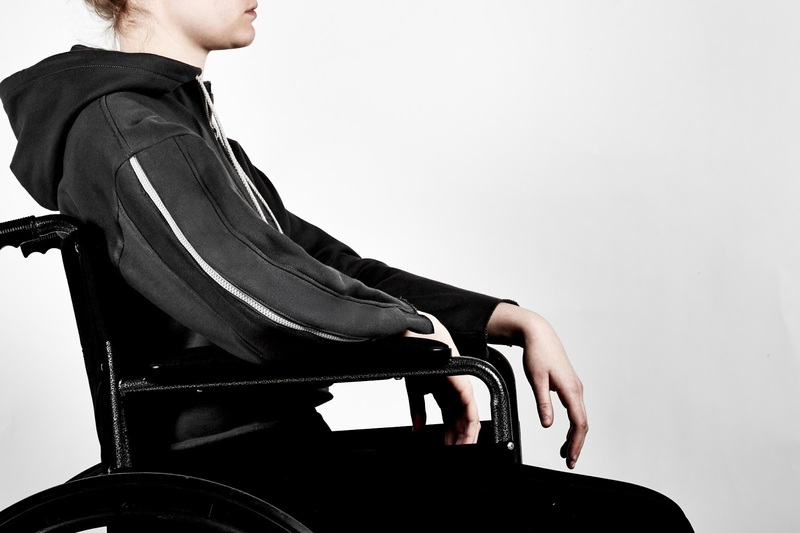 What does that mean for people with disabilities who often can’t wear mainstream clothes? Lucy Jones: Everyone should have the right to express themselves. Say I’m wearing trousers that have some sort of detail on the pocket. If I sit down, the detail doesn’t work in the seated posture. That’s a shame that detail doesn’t apply to someone who uses a wheelchair. They should have the same rights of expression. BLOOM: My son isn’t able to fit standard sizes, and it seems that people with disabilities often have to choose function over style. They have to choose clothes that accommodate their differences, but aren’t necessarily the clothes they want to wear. Lucy Jones: If you’re a great designer you should know how function and design go hand in hand. That needs to be drummed into designer’s heads. Function can determine style, and each should inform each other. The biggest thing when I come up with a new function is I say ‘Is this stylish? Is this desirable? Would I wear it? Would my friend wear it? If I’m seated, do I feel great and comfortable and attractive?' When designing, we should be asking questions about how it looks in all different positions, and how it functions if you only have the use of one hand or you’re an amputee. We shouldn’t be designing based on how something looks on a hanger. BLOOM: I understand your cousin Jake, who has hemiplegia, is the inspiration for your work? Lucy Jones: Yes, he gave me the idea. He rang me up about four years ago and I asked him how his day was. He said it was really bad and the little things in life really get him down—like doing up his jeans because of the fly front and zipper. He dresses with one hand. So for Jake it's a chore. BLOOM: What are some of the ways that off-the-shelf clothes don’t work well for people who use wheelchairs or who have other physical disabilities or weaknesses? Lucy Jones: A did a lot of focus groups and learned about things I hadn’t thought of. For example, the weight of clothes if you have trouble with balance or if one side of your body [is paralyzed]. Coats are super heavy. It’s very hard in standard clothing to maneuver your body into arm holes and zippers, especially if you can’t see them. With many clothes, wearing them in a seated position is uncomfortable and not a good fit. If you’re seated, your jeans will fall in the back, because your fat and muscle spread. Your thighs expand, your kneecaps are bent and fabric gathers in the back which is uncomfortable. Buttons are real challenges. Collars are an issue. If you’re self-propelling in a wheelchair your neck and muscles are far stronger, so you’re going to have more muscle bulk. So standard collar sizes won’t suit a standard top anymore. You’re going to end up needing a larger collar with a size small. These are things that have to be looked at. BLOOM: How did you find models to work from? Lucy Jones: That was really easy. I sent a mass email on Craigslist and posted on Yahoo classifieds and contacted organizations. I couldn’t believe the response I had back from people saying 'I'd love to work with you.' I did focus groups. One of my main models is Ronnie. I love her energy. She has multiple sclerosis and she’s really struggled with clothing. She grew up wearing a standard size, then she began using a manual wheelchair and then moved to an electric chair. It was so interesting to see all of the alterations she had done by seamstresses so that clothes would fall better and feel more comfortable as her body changed. Ronnie can't independently dress. I was dressing her and I noticed how difficult clothes are for a caregiver dressing someone. BLOOM: What is different about your designs for people using wheelchairs? Lucy Jones: The main difference is the entry point into garments. I know elbows are an issue if you don't dress independently. It's uncomfortable when caregivers pull limbs through armholes. I found ways to open up the back seaming to expand the space to provide for comfort. Then it would draw with a string back into a tie or bow that is much more appealing. I completely altered the anatomy of the sleeve (see photos below). I add way more fabric and padding around the elbow. That way if you're resting, your arms can lay more comfortably. If you're self-propelling, you have the amount of pull in the elbow you need, so it doesn't put pressure on the fabric. I did the same to the kneecaps: I took away all of the gathering at the back of the knee crease. The other functionality I added is zipping. I realized when I was pulling Ronnie's arm through a sleeve how difficult it is to get a sleeve over the elbow. It's like putting your foot through a sock. Ronnie wanted to wear shirts. Shirts are everywhere in everyday society. She's a business woman and she wanted to look formal. So I did the shirt so that the whole arm can be zipped up in the sleeve. You put the arm through the armhole and lift the sleeve around the arm and zip it up, like you were putting a banana back together. BLOOM: There are some designers who make clothes for people with disabilities but I've heard they can be quite expensive. Lucy Jones: We want clothes that can be affordable. Because this project was a school thesis, I was allowed to think big and not think about the cost. A lot of my functions would not be cheap to produce and manufacture. But other things, like the sleeves that open with zippers, are easy and really cheap. I would never want to make a separate line or category of clothes, because I think everyone should go and shop where they want to shop. It should be mainstream. That's why I'm working with Runway of Dreams. They're going to be having a huge launch with a major brand in March to adapt existing clothing. So it's the exact same line, the exact same clothes, with the adaptations built in. Lucy Jones: It's kidswear but the sizing runs up to adults. BLOOM: What is your role with Runway of Dreams? Lucy Jones: I'm working with Mindy to launch a new campaign for diverse individuals who use wheelchairs or crutches or who are amputees. It's so diverse and obviously the alterations need to reflect that. It's problem-solving. It's knowing you can make someone's day easier and make them feel included. BLOOM: Do you also do other work? Lucy Jones: I won a nation-wide competition and am working with Eileen Fisher on a one-year residency as a social innovator. I'm working with two other girls to design solutions for all of the damaged garments that customers have brought back that we don't want to put in a landfill. There are heaps and heaps of damaged garments. BLOOM: Wow! Amazing. How does it make you feel to know that Forbes has named you as a top entrepreneur? Lucy Jones: I think this is showing that there are steps toward inclusivity in design. The fact that people nominated me and the design judges thought it was a great idea for the fashion industry. It makes me proud to know we're moving in the right direction. BLOOM: Sometimes I feel cynical about people in fashion wanting to see more inclusion, or even understanding why it's important. It seems that how we define beauty is becoming more and more narrow. Lucy Jones: What I have seen, and what I do think is so positive, is this collaboration by Runway of Dreams with the major brand I was talking about. We had an event with kids with disabilities modelling the new clothes and having the best day ever. Most of the parents were in tears because they said this is crazy to have our kids wearing the same brands as the other kids. Kids with disabilities are singled out in the class and the parents said that to have their kid wearing exactly the same thing was a huge breakthrough. Parents of young kids were choked by the whole thing. One dad said he couldn't express how much it meant to him and his family. The CEO was present and the style team said this was one of the best days they've had at work. It totally shook them to see how happy the parents and kids were. BLOOM: I imagine that experience made them feel like they were respected and valued. It said something about how they were viewed. Lucy Jones: Even though it was positive, it was almost like, why should they have to live with that? Why hasn't this already been done at a high level of design? BLOOM: I know parents who spend an unbelievable amount having mainstream clothes tailored, but sometimes they still don't end up looking right. Lucy Jones: We want adaptations already in the garment. This is design for humanity. This is just one collaboration. The idea is to tackle loads of brands and if we can have the same experiences with many brands, I think we're going to make waves. I get shivers thinking about it. BLOOM: You said your project at Parsons explored the relationship between disability and beauty. But disability doesn't usually fit into conventional ideas about beauty. Lucy Jones: I think there is a way to change perceptions. There's no simple answer to that, it's just great design. We've been informed as a society that when people look or walk differently it's a bad thing. It's not, it's just adjusting your eye. There's a famous furniture designer that I love, Charles Eames. He made a leg splint that I thought was a wall piece. I thought it was an ornament because it was so beautiful. That's really smart. I want to see hearing aids with Beats. There's no reason why walking canes can't be 3-D printed. When you have a wheelchair it doesn't have to look bulky and thermoplastic. You can redesign it to be whatever the person wants, whatever makes them feel themselves. Great designers know how to do it. Such a great idea... and why not. I was pleased when I found a fun leopard print cape for Heni to wear in her chair instead of trying to struggle and put on a coat. works a treat and looks great. It is always nice to have something that is practical and looks great too. Why are we at 'war' with cancer and disability?